“Nantucket Lightship Baskets” today are as unique as their fascinating heritage and history, which dates back to the earliest inhabitants of the island. The popular baskets are traced to the second half of the 19 th Century and the Lightships which were stationed off of Nantucket ‘s coast. During this period many famous basket makers made their best baskets while stationed on the South Shoal Lightship. This is the heritage of quality and originality that we continue today. “Is this ivory legal?“, is a frequently asked question. All of our ivory products have been purchased pre-ban from reputable sources, mostly private collections. Elephant ivory before 1989 and whales teeth before 1972. A summary of the International and U.S. Fish & Wildlife laws which regulate the commerce of ivory follows. The Convention on the International Trade in Endangered Species (C.I.T.I.E.S.) formed in 1973 to establish worldwide control over plants & wildlife that require protecting due to declining populations. C.I.T.I.E.S. regulations do not control a country’s internal commerce, only the international trade between nations. **Shipping-Wildlife product commmerce is regulated on a state and federal level. Interstate (between states) commerce of these products in the U.S. is regulated by the U.S. Endangered Species Act of 1972 by the Department of the Interior/U.S. fish & Wildlife Service and by the Marine Mammal Protection Act of 1972 put in place by National Marine Fisheries Service. Each State has a Department of Fish & Wildlife or Game Department located in the state’s capitol. Before buying wildlife products you can check with your state game officials to see what the laws are for your state. **African Elephant Ivory-C.I.T.I.E.S. Endangered Species List does not allow the importing, buying or selling of African elephant ivory internationally. It cannot be imported into or exported out of the U.S. and the same is true for most other countries in the world. If your elephant ivory is pre-ban 1989 it is legal to own, buy, sell or ship within the U.S. and there are no permits or registration requirements. All of our elephant ivory is pre-ban 1989. **Whales Teeth-The sperm whale is an endangered species that is regulated by the Marine Mammal Protection Act. Since 1973 the importation of these products for commercial use has been prohibited. The Interstate sale of registered pre-act teeth with scrimshaw is allowed under a special federal permit. Unregistered pre-act teeth can no longer be registered and cannot be transported across state lines for commercial purposes. Antique ivory whales teeth (100 years plus) can be sold interstate. Since we are in Massachusets, the law says that we cannot ship whales teeth outside of Massachusetts and all of our teeth are pre-ban 1972. **Mammouth or Mastodon-Commerce in this 10,000-40,000 year old ivory is completely unresticted. Serving the discriminating buyer for over 42 years in business! 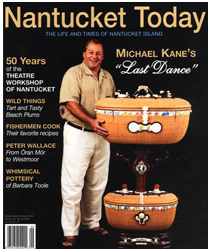 Craftsmen, Michael Kane, began weaving his heritage through Nantucket Lightship Baskets in 1969. He learned his trade from his grandparents, Mr and Mrs. William Reis, Sr., and began his own successful business while still in the eighth grade. His baskets are crafted with sturdy oak staves and handles, woven with rattan, and rest on a solid wooden bottom. They are often accented with beautiful decorations of ivory carvings and scrimshaw. His grandparents taught him to use oak instead of cane because experience taught them that oak is the sturdiest and would make the finest basket. 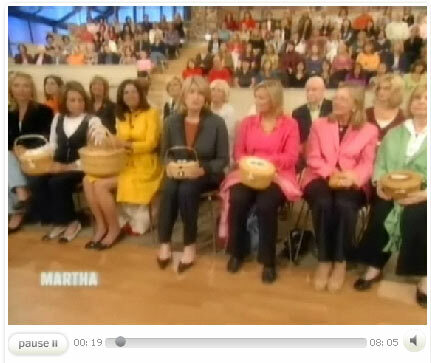 Michael’s first basket was sold in 1969 at his mother’s business, Bette’s Luncheonette in the Nantucket Pharmacy. 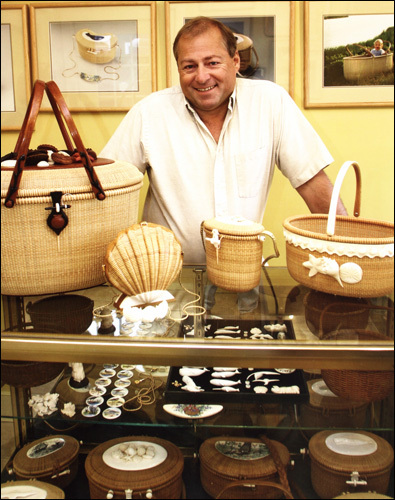 As the years passed he began to supply baskets of various sizes to Morgan Levine at the Four Winds Craft Guild. Michael soon established a well-known name for himself and decided to branch out on his own. He moved to his present location where he is producing the finest baskets of a unique craft which has lasted for over 200 years. Michael is best known as the originator of the tight weave. Only on Nantucket, can you find the REAL Nantucket Lightship Basket.